There may still be local authority chief execs and directors in local government who think they can steer a course through the financial challenges to come (the handy headline figure is a forecast £14.4bn shortfall in services by 2020) by reducing staff numbers and service levels, raising efficiency and changing eligibility criteria, but I don’t know them and I’m pretty sure they don’t exist. 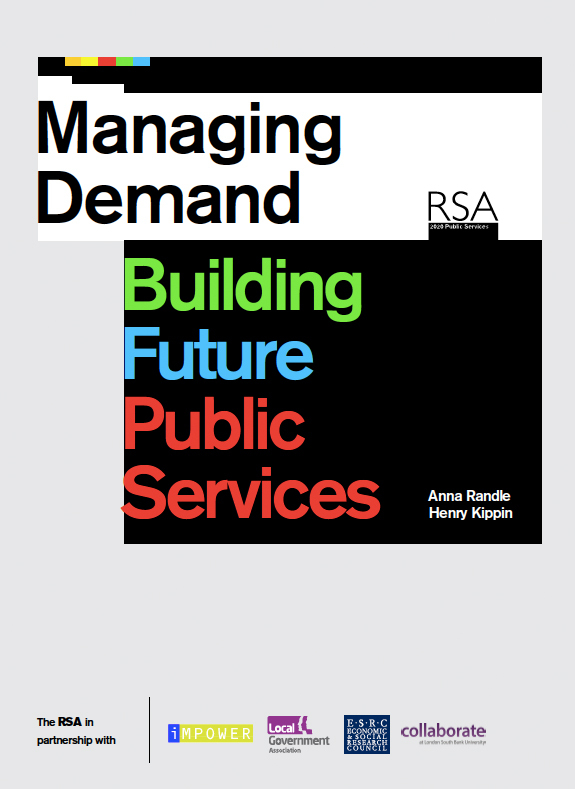 And, encouragingly, neither do the authors of Managing Demand: Building Future Public Services, Anna Randle and Henry Kippin. As they point out, these measures realise immediate savings but don’t shape services for the long-term. This report is essential reading if you’re interested in the future of local public services. To me, it marks out the territory that should be occupied by anyone working on developing local public policy and practice. It should be, of necessity, the new black. Anna and Henry cover a lot of territory – perhaps too much. There are dozens of aspects worth writing about, but I’m focused here on the topic closest to my heart, as its my job: using behavioural insights. Managing Demand and the emerging practice it reveals, is particularly interesting to me because of the coincidence of this stark challenge to public finances and the rapid growth of evidence from behavioural sciences. As I’ve explained to many people, I’d be promoting the use of behavioural insights to policy makers and practitioners right now, even if public finances were in rude health. The fact that they are not, though, provides even more of an opportunity for us to design services that reflect what people are really like: demand management done well means reframing public services and places – and we can knit into this redesign our rapidly improving understanding of just how context-dependent human behaviour is, and of how much less control we have over our actions than we like to think. If local government budgets were ticking along nicely, and the demographics were in our favour, the rationale for change simply wouldn’t exist. Experienced Housing officers will often explain to cititzens likely to become homeless what the limitations are to what the Council can do for them, in effect anchoring the conversation at the level of service that used to be possible when supply and demand were less unevenly matched. When resources are scarce, we want them more, for good evolutionary reasons, so officers may be inadvertently encouraging demand that is costly to manage and damaging for residents’ wellbeing. Waste and recycling communications are often framed around the needs of the service, describing the benefits in terms that give the citizen no emotional reward, and using terms (like ‘food waste’) that are at best ambiguous to most people. Letters to a tenant in the process of reducing their arrears often don’t provide feedback in a way that acknowledges their success; they may receive an identically-worded letter to that sent to tenants with increasing arrears. So we miss the chance to embed the key behaviour: paying off the arrears. Councils involved in projects to give away home efficiency measures often have limited success. One reason is endowment effect: our inclination to see something free as valueless. But it is also because they tend to introduce cognitive barriers into the conversation immediately, referring to ‘retrofitting’, not the emotional reward to the resident: a cosy, draught-free home. There are plenty of demand management approaches to issues like these which don’t utilise the insights from behavioural economics and psychology that are needed to reframe what’s on offer in a way that works with the grain of human nature. So what are the emerging approaches that do explore these, and which look like becoming part of the toolkit of the behaviour-smart local authority? One is behavioural auditing. This is a way of examining the way a service works to identify where demand is created, track this back to the need that the demand expresses, and use this as a starting point. For many services, apparently identical need will lead to differing levels of demand from different residents; analysing the behaviours of those who create little or no demand helps re-design in a behaviourally-smart way, as it give us insight into which behaviours to encourage. Another important aspect (not new, of course) is ethnographic research and observation. When we focus in on the behaviours that create service demand, understanding what it is that people do and how they do it is much more important to re-design than the reasons people give to explain them – and the rationale that officers apply. There is plenty of evidence that we adjust our views to accord with what we do, much as we would like to believe the opposite to be true! A third is co-production. Guided by a behavioural practitioner, officers, managers, service users, citizens, community representatives, etc (I’ve worked with teachers and nurses, for example) are able to understand and work with real insights from behavioural sciences and generate many of the approaches that they go on to put into practice. A word of caution, though. We are realising how difficult a behaviourally-smart approach can be to put into practice – for good reason. Why shouldn’t we be surprised at this? Individually and collectively, our default model for influencing people is to try to change their mind and persuade them. It’s based on the rational actor model. My experience on a wide range of demand management projects with local government and public health is that policy-makers and managers can accept the overwhelming evidence that behaviour is context-dependent and so target behaviours need to be made easier and appear more normal … but implementing this, when it challenges the mental models we have worked with since we were toddlers, is not straightforward. My view? Let’s keep the focus on demand management; let’s make our approaches as behaviourally-smart as possible; and let’s build the capacity in local government and communities to use behavioural insights.